Sonogrid helps you deeply explore music. You can use it like a drum machine, an advanced metronome, an ear trainer, compositional sketchpad, or just to have fun with sound and music. No musical experience is necessary to enjoy the app, and that’s what makes it fun, but certain features might feed your creativity if you already make music. For musicians, there are new time signatures, polyrhythms, scales, and the possibility to combine any of them in new ways. For dancers, a highly-flexible accompaniment that never needs to stop. For teachers, a clear way to represent time and help students understand the space between beats. For improvisers, something fun to play along with and to take you to new spaces. For music nerds, plans cancelled. 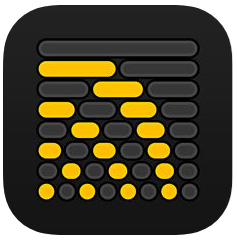 Use the app’s powerful features for beat making, ear training, keeping time, performing, and creative exploration. Most importantly, have fun! 1. Part imagination, part puzzle. 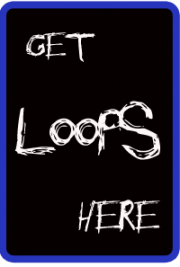 The main concept is to put looping rhythms on the screen in a way that they all relate to each other. Transform rhythms visually by shifting, stretching, and snapping. 2. More than 2, 4, 8, 16. The app is designed as a creative tool, with a screen that’s mostly a blank canvas for your ideas. It is a new way to explore the deep world of rhythm, and with virtually infinite possibilities you are not limited to even numbers. 3. Easy button or eighty-eight keys? Notes are selected automatically by default so that you can start quickly, but if you need more control you can manually select one for each track from a full-size piano keyboard. 4. Plays nice with others. The app comes with many built-in instruments but you can also send notes live to other apps if you want to have custom sounds. You can send MIDI out (maybe to a synthesizer app like Audulus, or a DAW on your computer like Ableton Live). You can also export your project to a standard MIDI file which can be played back on any device. 5. You already know how to use it. The interface is similar to multi-track recording software so you can mute, solo, move, stretch, and manage tracks intuitively. 6. Tenori to the limit. The familiar step sequencer has been transformed to be more flexible, but the idea of turning notes ‘on’ and ‘off’ is the same. The powerful transformations on each track are easy to access and understand. No mystery-meat navigation. 8. When does it line up? The phase is automatically calculated so you know when the pattern will repeat. 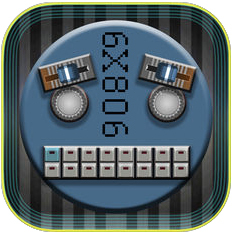 DRUM is based on the sound and feel of the classic drum machines you love. 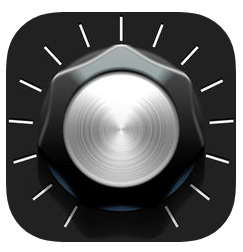 Simple analog style controls make it easy to use, tweak knobs just for fun! 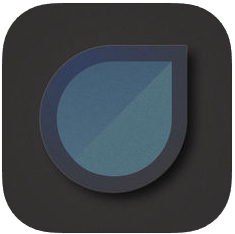 DRUM works with Garageband and your favorite Audio Unit (AU) Hosts, keeping your creative flow alive. 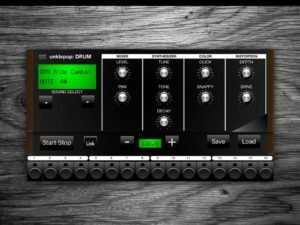 You can get the drum sounds you need in the apps you use.